I've been pounding the keyboard like a gaucho's thirsty horse galloping for the nearest waterhole. Whew! I was almost frothing at the mouth by the time I completed the first version of a 56-page translation. Teka, the cat, slept right through all the action, as usual. It was Tuesday afternoon and the translation was due the following Monday. That left me with plenty of time for the revision and final reading, and also some free time to do something worth doing. It was too late in the day to go anywhere. I decided to update the confessional (blog), but it didn't take long to realize that my mind was drained and drifting. That's when a random unrelated thought popped into my head: Jakatar's Hurth transmission has lost that sweet "clunk" sound when shifting into forward. In fact, it has already given me a few "=/&$#, I'm screwed" moments while maneuvering in the marina. "I motored ahead and by the time I realized I had no steering, I was almost on the rocks. So I put it in reverse, but it began to go sideways before colliding with your boat. My God, your boat is built like a tanker, I barely scratched the gelcoat with the anchor. Anyway, you better come down and have a look." Yeah, right! He forgot to mention that his anchor locked horns with my Voyager windvane, leaving it bent and cracked, before it proceeded to plow a nice long gouge in the gelcoat. Ouch!!! Let his boat insurance take care of it. I didn't want to inflict that sort of damage on any other boat, or my own, because of a faulty transmission. Instead of meditating or going for a walk, I started thinking about my transmission woes. Where the hell was I going to get a transmission in Portugal, and for a decent price even if I did manage to find one. It was time to saddle up the computer again and cruise UK sites for boat transmissions. These are the times when I wish I was back in North America where you can get anyting you want, when you want and without hassles. Sure, I could order one through the Internet, but I'm through with importing equipment from anywhere outside the EU: the customs authorities crucify you with absurd import taxes and paperwork. You learn to take the path of least resistance. So this morning I got up early as usual, around 6:30, exercised in the attic for 30 minutes, performed the morning rituals and plopped myself down onto the saddle to start revising the translation. Just about fell off the chair when I opened the folder containing the original file and realised I had to translate five files. How could I forget something like that? No wonder I was doing so well. Some days I wish I could be a cat and sleep the day away. My home for 7 years, and it all began like this. On a sunny autumn afternoon in Lisbon I was leaning against a pinkish 8-floor apartment building waiting for the real estate woman with a promising telephone voice. Earlier in the morning I had driven the Toyota pickup truck to the University Campus, parked in a dusty eucalyptus stand turned into a parking lot, and then took the subway to the Rossio Square. Downtown, sitting at one of the colorful outdoor cafés, I watched a two-way stream of faces, bodies and attires that contrasted with the quiet beach town where I had lived for five years. It was like being in a film in which something dramatic is about to happen. Sometimes a young woman shot me a look, but nothing materialized except the fantasies in my head. Being alone in a city is like that. By the time the waiter took my money, the empty beer glass and the sandwich dish, the big-city novelty was already fading and the faces in the crowd were losing their mystery. I walked down Rua Augusta - a beautifully cobbled wide street for pedestrians lined with upscale shops - until the next intersection where I waited for streetcar 28 going west to Campo de Ourique. The old streetcar jolted and clanked snaking along narrow streets of old quarters where pedestrians, looking more like villagers that city dwellers, walked the narrow sidewalks hugging old plastered walls trimmed in stone blackened by diesel exhaust. It was still early when the streetcar stopped in front of the park, and I got off on impulse. Here's a link to a video of streetcar 28 to the sound of Fado music. Near the entrance gate there was a glassed café and restaurant. Most of the tables next to the duck pond shaded by large trees were occupied with patrons eating lunch in the company of pigeons and sparrows looking for fallen crumbs and scraps. Breathing the scent of foliage and flowers, the spring sunshine warming my body, I recalled the real estate woman's voice over the phone as I walked the main path past old people on park benches, teenage couples entwined on the grass, two more gate entrances, another duck pond and back to where I had started. 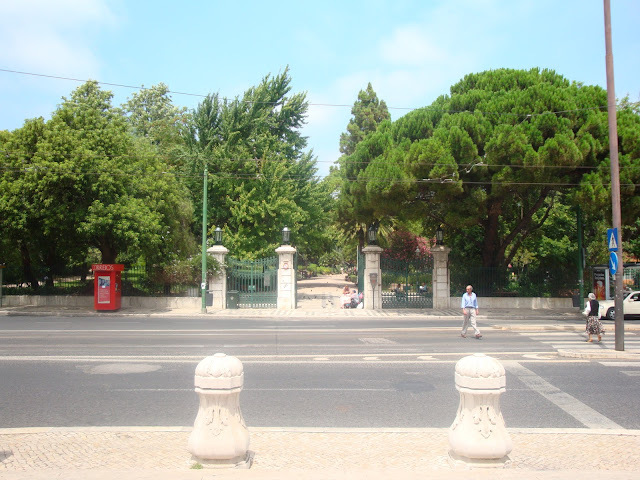 I then followed the streetcar tracks leading to Campo de Ourique, which struck me as a picturesque town within a city. Sooner than I thought, I was facing a fairly modern pinkish building with its own square on a street running all the way down to the Tagus riverside. I was thirsty by now and drank a mineral water at the counter of the small café on the ground floor. Then I went outside and leaned against the wall in the warm sun. When a woman pulled into the parking lot in a black Audi A3, glanced in my direction and double parked unhesitatingly, I knew it was her. She walked briskly toward me wearing a knee-length black skirt, matching blazer and a white blouse. As she got closer I noted that she was petite, even in high heels, and her light complexion contrasted appealingly with her wavy black hair. “Are you Mr. Horacio?” she asked. I said yes with a quick glance at her push-up bra cleavage that revealed more than what you’d expect from a real estate saleswoman who looked five or six years older than me. She introduced herself as Julia and we shook hands. After some small talk, we went inside and took the elevator to the third floor. I stood towering over her as she searched for the key in her bag, opened the door and then politely ushered me in with a smile and a sweep of her arm. First she showed me the small dreary bathroom with an electric water heater bolted onto the wall above the head of the bathtub. "It's a shame about the bathroom," she said shrugging her shoulders, "otherwise, it's such a lovely apartment." It didn't take long to see the unfurnished one-bedroom apartment that, in addition to the bathroom, had an unusually large bedroom, a dining/living area and a narrow kitchen leading to the balcony overlooking the square. As I looked out the window at the buildings and cars parked everywhere, I began to have second thoughts about this whole Lisbon business. In any case, this was temporary, just another stepping stone on a directionless escapade. The real hesitation was whether I wanted to live in a city at all, even for a short period. "It's an excellent opportunity for the price, wouldn't you say?" she broke the silence in that upbeat manner salespeople put on to drum up enthusiasm. "Perhaps," I replied vaguely, looking at a stain of red lipstick on her upper teeth before she closed her lips. "And as for the bathroom," she went on looking into my eyes, "I can recommend someone who'll do a excellent job for a reasonable price." "But the water heater over the bathtub, now that's a problem," I said smiling, planning to use it to my advantage. "Vá lá, there's a solution for everything," she patted me on the arm playfully. "Let's have another look." We stood in the small dreary bathroom staring at the large water heater bolted over the bathtub. "Do you prefer to shower or to bathe?" she asked. "That's perfect. The bathroom needs to be renovated anyway, so you can throw out the tub and divide the space into a shower stall and a heater compartment," she said and ran her fingers lightly over the inside of my lower arm. "Perhaps," I said, feeling the effect of her touch. "And you can also use the heater compartment for storage," she added, her voice noticeably huskier, and touched my back just above the waist. "Is it wide enough?" I asked, really feeling it now as we stood very close. "Of course it is." she said and quickly glanced down at me. "Maybe it would be large enough for you, but I don't know about me," I said and felt her arm brush mine as we seemed to lean toward each other. "Can I step into the bathtub just to get an idea?" I asked, no longer concerned with my growing condition. I stepped into the bathtub with a chuckle. "I'll pretend I'm showering," I said playfully and went through the motions. "You'll get your clothes all wet," she laughed. "It will probably be a little tight," I said, "It's hard to tell without a real wall." "I'll be the wall," she volunteered, kicked off her shoes and stepped into the bathtub laughing embarrassed. She positioned herself like a partition close to the heater, facing me. Her chest heaved slightly when she said "Now try it." Julia showed me the apartment two more times before I bought it. We also went for dinner a few times, until it became clear that a divorced woman with two children and a wannabe writer live in very distinct realms. Today was a boat day. That means I translate on the boat, make my famous vegetable stew and, if I'm lucky, do a bit of boat work. Got the large translation done before lunch, way ahead of schedule. That's because I work like a maniac before boat days to get ahead. Translating at high intensity can distort your face...not to speak of your mind, as proven in the photograph below. After lunch I took a relaxed walk through the marina to ventilate my spleen. Then I put another layer of white paint on the panels I had started to paint the other day and finished just Before Luis showed up. Luis came to look at the gelcoat damage in order to write up an estimate for the insurance company. Two weeks ago a 37 foot hunter lost its steering and rammed Jakatar (that's my boat) with its Delta anchor which then got tangled with my windvane. The skipper gunned the engine and now my Voyager windvane is toast. The other guy's insurance is paying the bill, let's hope. Luis runs a boat shop and also owns a sailboat. We sat in the cockpit looking at this character boat that had sailed in yesterday. "Some guys are smarter than others," said Luis looking at the boat. "Some people work years and years to buy an expensive boat and these two [referring to the youngish hippie-like couple] probably paid next to nothing for the boat and here they are, going places we only dream of." Although a lot of people would kill to be sitting on a sailboat on a beautiful sunny day, our minds were fixated on loftier goals. But don't worry, I won't start cackling about "living the life", since that topic has already been talked and written about to pulp...so much so, that it has become mere pulp fiction populated by faceless souls despairing about their personal doldrums. If you're reading this you must already know the score. Unfortunately, I know it all too well. Welcome to Zero, it's time to find our Zen. I shouldn't be anywhere near the confessional (blog). I have a 16,000-word translation that was originally due next Monday. Now they called me and asked, implored, demanded that it be finished on Thursday. This is why I'm living in Zero Land to the sound of the clock ticking, ticking, ticking away. Instead of singing that glorious Janis Joplin song "Oh Lord won't you buy me a Mercedes Benz" I'd rather croak "Oh Lord won't you give me some freedom". Just so you know, I got rid of my Mercedes 190 D about 6 months ago. Nevertheless, it was the damned best car I ever had. Owning an old sailboat can be a curse or a blessing, depending on your personality, your mood at any given moment and on how many things need fixing, varnishing or just plain head scratching. I've come to the conclusion that if you strive for perfection buy a new boat, otherwise you're likely to become crankier than an old Hurth transmission. Having finished a fairly large translation on Wednesday, I drove to the marina Thursday morning to do a little maintenance. I could call it "Zen and the art of boat maintenance", but that would be about as kitsch as a flock of pink flamingos on my lawn. Nevertheless, boat maintenance can become a spiritual and liberating experience, to me anyway. Today I decided to try some interior painting. The bare panel in the picture below has been bugging me far too long. It's also sagging and needs trim to hold the edges firmly in place. While I was at it, why not paint the panel on the portside over the stove and, to get more mileage out of the brush, may as well paint the bare plywood in the pots and pans cupboard. If anybody is looking for painting tips - forget it. I took the panels down, sanded them with 220 and slopped paint over them, one coat in the morning the other in the afternoon. In the interval I made a tomato, pepper, onion, sweet corn and tuna concoction that would have tasted even better if I hadn't forgotten the wine. I also ran the engine for a while in reverse and forward to confuse the barnacles camping on the propeller. Amazing creatures, they could stick to a spinning propeller from here to China and arrive just as sane and healthy as if they had been sitting still all their lives. That was enough "Zen maintenance" for the day. On the way home, I fed our vacationing friends' 7 cats and took this picture of the coastline. Coastline view. Click on the picture and you'll see the "Cabo Carvoeiro" cape in the distance and the Berlenga Islands to the left under the cloud formation. I drove 15 km to the marina to check on the boat on a typical autumn day in Portugal, under a patchwork of grey clouds splattered onto the sharp blue sky. The port’s parking lot was still fenced off because of the recent stormy weather, so I parked the jeep near the fort and walked across the empty cheerless pavement to the marina entrance feeling the breeze that had lost its warmth. At the boat, I dried the bilges, changed the alarm battery, readjusted the fenders a bit and left. It was one of those days when you don’t have the time or the inclination to start doing any real maintenance work. This, of course, triggered a vague feeling of guilt and sorrow. On the way out I checked on Ryker, my Dutch buddy who has been living mostly in Peniche for a number of years. I found him sitting in the cabin of his 7 m fishing boat reading a magazine. We walked to the transient dock and stood looking at a beautifully varnished 13 m ketch with wood masts. The lifelines were cluttered with drying clothes, but nobody was aboard. Ryker told me how the French owner had worked seven years to restore the boat to its current pristine condition, during which time he was consumed with the dream of sailing to the Caribbean with his wife and daughter. The hiccup was that they got caught in some nasty weather sailing down the coast, and that was it. The wife and daughter were through with sailing! This was the end of the line. 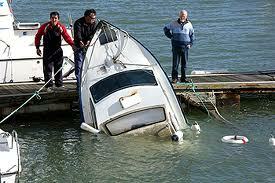 Anyway, the owner wanted my opinion on the best place to leave the boat for the winter. I told Ryker that Nazaré, only 20 miles north, would be my pick. 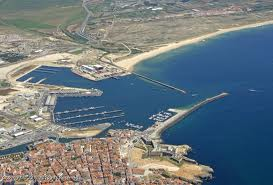 It’s a small sheltered port and the marina is tucked into a corner protected from the wakes of commercial fishing boats. He could also put it on the hard, if he wished. As we stood there discussing the situation, part of me wandered off into a daydream in which I sailed to the Caribbean, crossed an ocean again and lived carefree in warm foreign anchorages. Then I though about how the French owner had worked during his spare time for seven years driven by daydreams of embarking on this very voyage that had now shipwrecked at this sorrowful marina. That's when it occurred to me that it was no longer autumn, it was already winter. Does this dude look emotionally intelligent to you? It’s been a rainy day filled with work. I got up at 6:30 while it was still dark, climbed the spiral staircase to the attic and exercised for 30 minutes. Then I showered, got dressed, had breakfast and continued to translate lawsuit exhibits into English. I got a little ahead and decided to enter the confessional – the blog. Has blogging become a cult religion? I initially began this entry by writing “I’ve always been fascinated by emotional intelligence.” But what I really wanted to say was that I’ve always been amazed by people’s lack of emotional intelligence, including my own! 1. Self-awareness – the ability to read one's emotions and recognize their impact while using gut feelings to guide decisions. 2. Self-management – involves controlling one's emotions and impulses and adapting to changing circumstances. 3. Social awareness – the ability to sense, understand, and react to others' emotions while comprehending social networks. 4. Relationship management – the ability to inspire, influence, and develop others while managing conflict. Whew! That’s a tall order. I’m more comfortable with the first two: Self awareness and Self-management. I definitively need to work on Social awareness and Relationship management. And I have a gut feeling that I had a propensity for attracting friends and women (relatively speaking) because, in fact, I was reasonably self-aware and self-managed. So what’s the point to all this egocentric blabbering? Well, it takes us back to the “Zen to Zero” odyssey. Being Zen is being emotionally intelligent…or perhaps “balanced” is the more appropriate adjective. Remember, I’m still in the confession stage. Darkness is falling as I write and Ana should be arriving home from school soon. My life from Zen to Zero. I can’t get this thought, feeling or regret out of my head...even though it's a slippery path toward a life of sterile wishful thinking! I know I'm not the only person facing this dilema, but knowing that doesn't help one damn bit. Zen does not reside in my beautiful house, equally amazing garden and ocean view, it’s not in the high-end furniture or in the jeep parked in the tiled garage and it’s not in the 39-foot sailboat at the marina either. I've slowly driven Zen out of my life and replaced it with junk. A very instructive blog called "zenhabits" by Leo Babauta will teach you how to develop Zen habits, and it definitively worked for him. I, however, hold a different perspective: sure habits are marvelous, but while habits iron out wrinkles and mold you into a more balanced person, what's really nipping at your heels is the burning desire to take that giddy leap of faith, to burst out like a caged animal. You've read about it, you've watched it in movies, you've dreamed about it and you crave to be there...and "there" is whatever you truly desire and want out of life. Perhaps it’s not that clear cut, but that’s how I’ve come to see it. Zen to Zero is about a voyage in the opposite direction, about building a trap, either slowly or suddenly, the speed doesn’t really matter. And don’t blame it on TV, peer group pressure, social needs, your partner, lack of partner, bad luck or whatever. Blame yourself, like me. So why don't I simply reverse the voyage back to where I started instead of rattling on about it in a blog? Because, as I already said, we're not simply talking about habits but, rather, about gaining enough momentum to take a substantial leap. At this stage I'm still bleary eyed wondering how the hell I fell into this hole and also realizing that I have to deal with it before it's too late. Additionally, Zeros are like alcoholics (alcoholics used to be sober and Zeros used to Zen, even if only in their childhook). First, we must admit our condition. We need to look in the mirror and confess it, to say it out loud, “I’m a Zero and I want to be Zen.” Say it a hundred times before you fall asleep, when you're bored or frustrated, say it until you really want it, say it until it’s true. And what exactly is Zen? It’s the enchanted child inside of you that would rather watch seagulls on the beach than drive a Porsche. I began writing this blog as my own form of Zen therapy, simply because I want it back. How does a blog do that? It places my current situation and surroundings into perspective and brings back the focus. Writing is therapy. That's why there are so many bloggers. Just think, Leo stopped being a Zero after he started writing about Zen, not the other way around. I’m Zero and I want to be Zen, say it with me. View from the terrace. Notice the stormy weather and waves just above the roofs. I'm pretty much always working on one or various translations at the same time. Right now I have a legal document due on the 11th, a one-page assignment due tomorrow and another that I finished today right after lunch. Since Windguru is forecasting stiff wind and waves of nearly 8 meters from the west for tonight and tomorrow, I drove the old jeep out to Peniche to add an extra fender and more lines to the boat. Waves that high will leap over the breakwater and wash into the marina causing the boats to strain at the lines and to act like rocking horses. I was going to work on the boat (translating, not boat work) Thursday, but it doesn't seem very feasible trying to concentrate with the wind whistling off shrouds, halyards slapping against masts, nylon lines groaning against cleats and the constant rocking action. Here's what it looks like on a bad day. The picture was taken by someone else from a marina pontoon. Here's the unfortunate result. Picture taken from a local newspaper report last year. 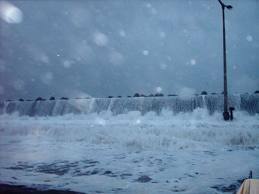 The same breakwater on a normal day. Note the number of tetrapods for added protection. This aerial view gives you an idea of the port's configuration. And then there is this google earth shot. This big boat has been here for a couple of weeks with lots of young people aboard. I hear the captain discovered that one of his wooden masts is rotting. The economic crisis rained on my escape plan. It's not that I'm broke, I've merely been short-changed. The tide has changed and so has the blog. Forget about my past. Nobody wants to read yesterday's news, even if it's a good story. But if you're still curious about how I got this way, then read the early blog entries. That's all the information you'll need to make sense of this journey. "Zen to Zero" is a metaphor for what is happening now, for my current predicament after taking that one damn wrong turn. Years of struggling for total freedom wasted like all the hats I've lost at sea. 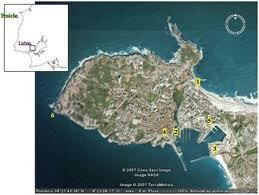 As of today, I unveil me, right now, right here in Peniche. Maybe I'll still reminisce about the glory days now and then, but I'm sure you'll forgive me for it. Jakatar, my white Corbin 39 pilothouse sailboat in the center. The strange yellow boat was built in a nearby town by a Russian carpenter.